iOS 8.4 presents a completely redesigned Music app. Some elements of the new interface are better than the old ones, some are worse. After activating Apple Music in iPhone, 5 tabs will appear at the bottom of Music app: For You, New, Radio, Connect and My Music. To access my own playlists (the ones I synced from iTunes library), I need to go to My Music, then select Playlist menu through a dropdown, then choosing my own playlist. Somehow, after doing this several time, I got irritated. I can understand why Apple put the For You, New and Radio tabs there. They are indeed useful for us to access Apple Music. The most useless tab menu is Connect. For now, it only displays few useless information and I just can’t see any reason why it needs to be one of the 5 main tabs. Ping, Apple’s previous attempt to create social media on music failed. It seems to me that they are trying to do it again this time with Connect. After some exploration with Settings app, I finally figured out that we can actually replace that Connect tab with Playlist tab. 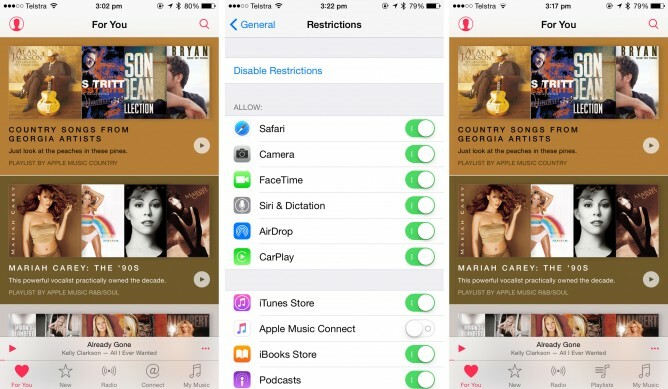 Go to Settings > General > Restrictions then turn off the switch for Apple Music Connect. After doing this, the 4th tab menu in Music app will automatically replaced by Playlist. In iPad, this is not an issue because it shows 6 main tabs instead of 5. So Playlist is already one of the main tabs menu. But you can still disable the Apple Music Connect if you like.